We love being outdoors in the summer and active whether it’s playing at the pool, at the park, in the backyard, or at the baseball fields. The kids love to stay cool in the summer by swimming at the pool, running through the sprinkler or playing water games. 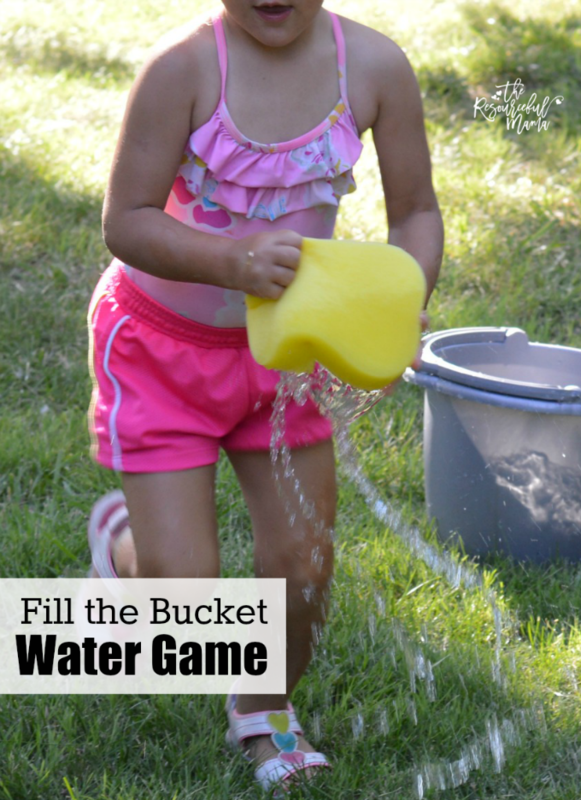 A favorite water game of ours is who can fill the bucket first. Before we do anything outdoors, we protect our skin from the sun’s rays. 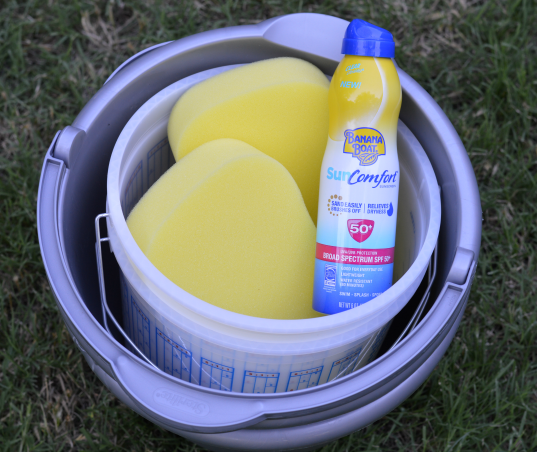 The NEW Banana Boat® SunComfort® Lotion Sunscreen is prefect for our family. It provides safe and effective broad spectrum and UVA and UVB protection and is a water-resistant formula (up to 80 minutes). I love that the NEW Banana Boat® SunComfort® Lotion Sunscreen helps sand to easily brush off and moisturizes while protecting. I purchased several bottles of Banana Boat® 50 SP sunscreen (it also come in 30 SPF) from Target and put one in the car, one in the pool bag, and a couple in the house for convenient use. It comes in spray or lotion. 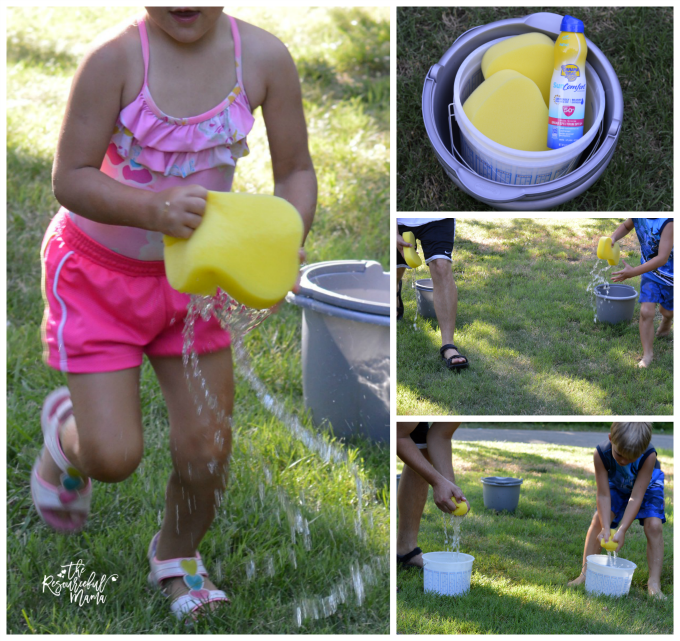 I prefer the spray, so I can quickly spray the kids as they are running out the door or rushing off to an activity like this Fill the Bucket Water Game. This water game is played by forming two teams. Each player gets their sponge wet and then runs to the the other side and squeezes their sponge into the container. This continues until one team fills their container or you run out of water. The winning team is the team who has the most water in their container. This can be played with a group, as a family, or just two kids. So much fun! It’s been so hot here that we have been visiting the splash pad almost daily. This would be a nice way to cool down at our home. Cant’ wait to get the supplies and play with my kiddos! Hi Jo – Thank you! I’m glad you liked the Fill the Bucket Game. You can include one image with a link back in your post.